This St. Michael the Archangel medal would make a wonderful gift for those who have a devotion to him, who are in the military, or in the police force. 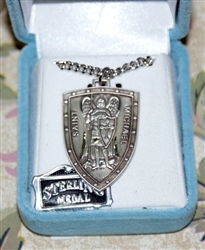 The medal is sterling silver and larger than a quarter. The chain is 24 inches long and is made of stainless steel. St. Michael is the patron saint of those in the military, the police, and those who seek spiritual protection.